2 Shelf Utility Stock Cart has a solid top shelf, heavy duty bar style bottom shelf, handle and corner bumpers. 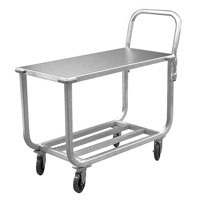 This double-decker cart moves product at a convenient, workable height from the floor. Perfect for narrow aisles with a width of 19". All-welded construction provides for heavy duty stocking. The cart is equipped with four 5" platform type swivel casters, two and two rigid and wrap around bumper on top shelf. NSF certified. Specs: 19"W x 46"L x 30"H; top shelf height 30"; shelf spacing 19 3/4"; capacity 700 lbs.